“Our Message“ is a 60 page, A5 format hard cover book with a novelty twist. The book is a compilation of 10 Christian Testimonials and 1 Testimonial Poem from ordinary, everyday people sharing their Christian faith with 12 Biblical Excerpts, 12 Tear Out Postcards, 10 Envelopes and 1 Bookmark. In “Our Message“, Greg shares how God changed his life. Primarily, “Our Message“ is designed as a gift book for Christians to confidently share with a non-Christian knowing that it contains the testimonies of other Christians supported by biblical excerpts, providing the reader with a clear understanding of the Christian faith. Uniquely, the book has pullout postcards featuring beautiful artscapes with envelopes inside the back cover. Uniquely, the book contains twelve superb, detachable photographic postcards, with envelopes provided inside the back cover. The book has been prepared by Sunshine Coast-based professional photographer, Greg Miller. In “Our Message“, he shares how God has worked in his life over the past 30 years. Although originally he had no interest in God, he relates how an invisible voice spoke to him in 1987 and the significant changes which have taken place in his life since then. 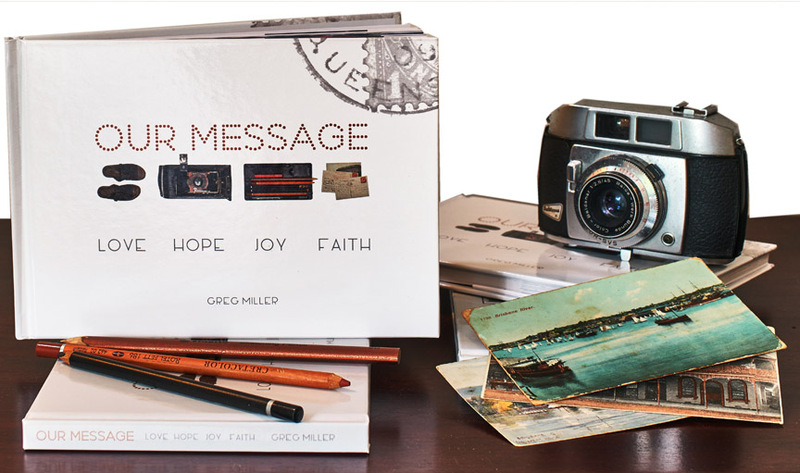 In 2016, Greg was inspired in his heart to stand before the congregation of Coolum Beach Baptist Church to share his project for publishing a book of cards. With the pastor’s blessing, he was encouraged to share his testimony and appeal to anyone else who would like to share how God had worked in their life. Over time, he received nine testimonies and one poem from others who attended the same church. Greg’s next step was to decide, in which order were the testimonies to be placed. He laid out the printed papers over the floor and prayed to God, “Lord, please instruct me as to which order these are to be in.” At first, all he knew was his own testimony was to be last. Then, he was inspired to place them in the order he felt best applied between the men’s and women’s messages. Finally, Greg chose a key point from each persons’ testimony and searched his photo files for images which best matched up visually with the messages. The gift of this book could save someone’s life for eternity. View the video of the Q & A style book launch of “Our Message”.